A native of Colorado Springs, Benjamin Randall has studied piano since he was six years old and is taught by Dr. Joan Sawyer. 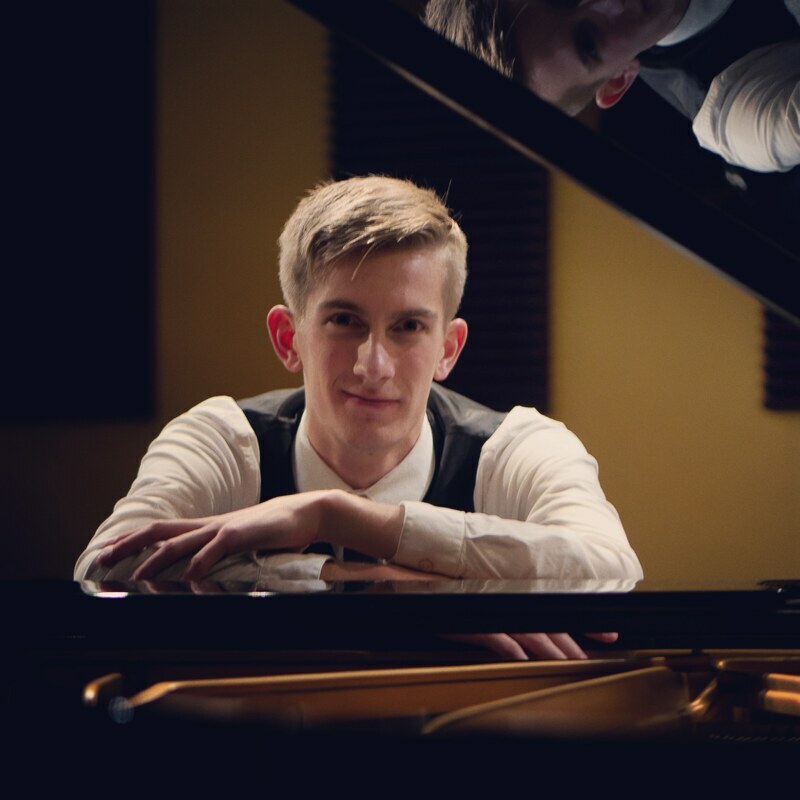 He is an avid competitor and has won many first place awards, including the Colorado MTNA Senior Piano Competition, the Schmitt Music Steinway Concerto Competition, the CSYSA-PPMTA Piano Concerto Competition, the CSMTA Rising Stars Lower Senior Piano Competition, and the Pueblo Keyboard Arts Festival Young Artist Competition. Benjamin is a roster member of the prestigious Young Musicians Foundation of Colorado. Graduating from high school in May of 2019, he attends The Classical Academy – College Pathways and Pikes Peak Community College. When he is not studying or practicing, Benjamin enjoys playing volleyball and choral singing. He plans to continue performing and studying both music and STEM. Emma Isabella Johnson is a high school Junior at Colorado Springs Early Colleges. She has studied violin with Vanessa White, Jerilyn Jorgensen and James Maurer, and now studies with Margaret Pressley. She also has studied piano with Mary Beth Shaffer and Carol Jilling. 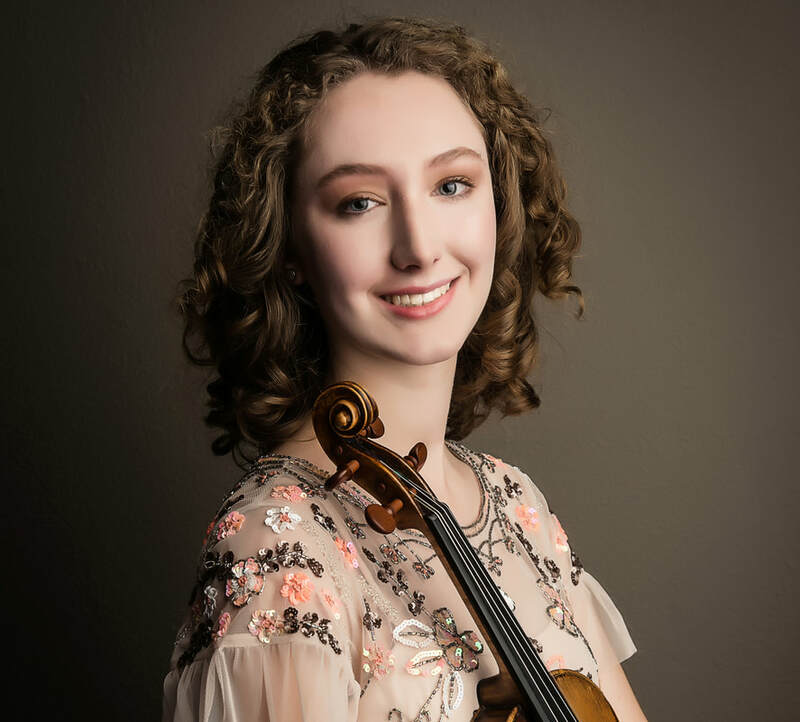 Emma is the current Concertmaster of the Colorado Springs Youth Symphony, is a member of its Collegiate-Performance Preparation Program and is a recitalist in the monthly Colorado Springs Music Teacher’s ‘Friday at 4:00’ recital series. Emma is a scholarship recipient of the Colorado Young Musicians Foundation and the Colorado Springs Philharmonic Guild. She made her solo debut, at age 14, with the Littleton Symphony Orchestra and has since performed with the Pikes Peak Philharmonic, the Colorado Springs Youth Symphony and the Loveland Orchestra, as winner of their Young Artist Solo Competitions. Since 2016, Emma has been a prizewinner in the Metropolitan State EOP Competition, Colorado Music Teacher National Association’s State Senior Strings Competition, MTNA West Central Regional Division Competition, Pikes Peak Philharmonic’s Young Artist Competition, Loveland Orchestra Young Artist Competition and the Jefferson International Young Artist Competition. Emma also is a 2019 National Finalist in the Stillman Kelley Instrumental Competition. In her spare time, Emma enjoys reading classic literature, hiking with her dog, Ruby, and spending time with friends and family. Emma plans to pursue a career as a professional musician and looks forward to returning this summer to the Aspen Music Festival to study with Julliard violin faculty member, Naoko Tanaka. Ian Patterson was born in Baltimore, MD in 2001. In 2005, he moved to Augusta, GA where, at the age of 4, he began his piano studies with Jinha Park. He has since lived in Heidelberg, Germany and now resides in Colorado Springs, where he is a Junior at Pine Creek High School. Ian currently studies piano with Linda Skaret. Over the last 6 years, he has won numerous awards in local and regional piano competitions under her tutelage. In 2017 he was the alternate in the senior division of the CSMTNA Concerto Competition. Ian is also an excellent French horn player and toured Australia and New Zealand last summer with the Colorado Springs Youth Symphony. This year he played horn in the Colorado Springs All-City Honor band and in the All-State Symphony orchestra. Ian is an honors student and enjoys his classes at school (particularly chemistry and programming). He loves to play strategic board games, and he loves outdoors activities such as camping and mountain biking. Ian is active in his church youth organization and participates in Boy Scouts. Meera Bhatia, age 17, is a junior at Lewis Palmer High School. Meera began playing oboe in 6th grade. She has participated in many music festivals including Interlochen and the Honor Band of America. As an avid soloist, she often takes part in many solo events, such as her school’s annual Solo and Ensemble Festival and the Colorado Springs Youth Symphony Association’s Collegiate-Performance Preparation Program. In addition to playing, Meera loves to teach beginner students. She made her solo debut with the Pikes Peak Philharmonic at the age of 16. She is currently studying with JJ Sechan and Noah Kay, and plans to pursue a career as a professional oboist. 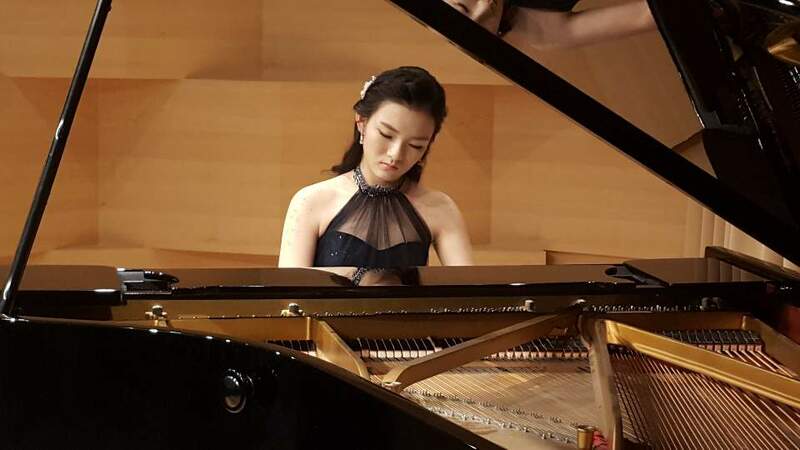 Kayla Yang started her piano studies at the age of 7, where she was enrolled in the Pre-Game Gifted Program in Gyeong Gi Arts High School from 2014-2015. She was accepted into the renowned Yewon Art Middle School in South Korea in 2017, where she studied with Dr. Byun, Jeong Eun and Dr. HyoJung Kim. She presented recitals at Younsan Art Hall in 2017 and at Winart Hall in 2018. Ms. Yang’s family immigrated to Colorado Springs in April 2018, where she resumed her piano studies with Mary Beth Barteau Shaffer, NCTM. 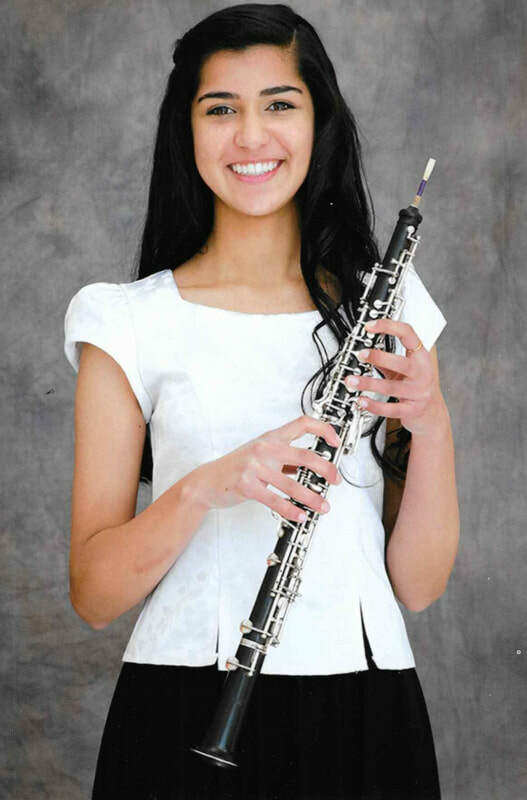 Since October 2018, she has garnered several awards including alternate in the Junior Piano Division of the MTNA state level competition, winner of the Junior Division of the CSU-Pueblo Piano Festival, second prize in the Schmitt Music, Division III, Advanced Competitive Competition, and fourth prize in the Chamber Orchestra of the Springs Concerto Competition. This July, she will be studying at the Cincinnati Conservatory of Music Piano Institute with Dr. Dror Biran. Kayla is currently in the 9th grade at Cheyenne Mountain High School, where she also plays piano in the jazz band. She is thrilled to have this opportunity to perform with the Chamber Orchestra of the Springs! Raleigh E. Eversole, V is an eighth-grade bassoonist at Lewis-Palmer Middle School. He currently studies bassoon with Greg Brown and previously studied with Rose Dunphey. Raleigh has had the opportunity to learn from other bassoonists including JJ Sechan, Karen Gregg, Ashley Haney, and John Parker. Raleigh performs in the Denver Young Artists Orchestra under the direction of Wes Kenney. He has earned chairs in the Pikes Peak Middle School Honor Band and the University of Colorado Middle School Honor Band for each of the past 2 years. 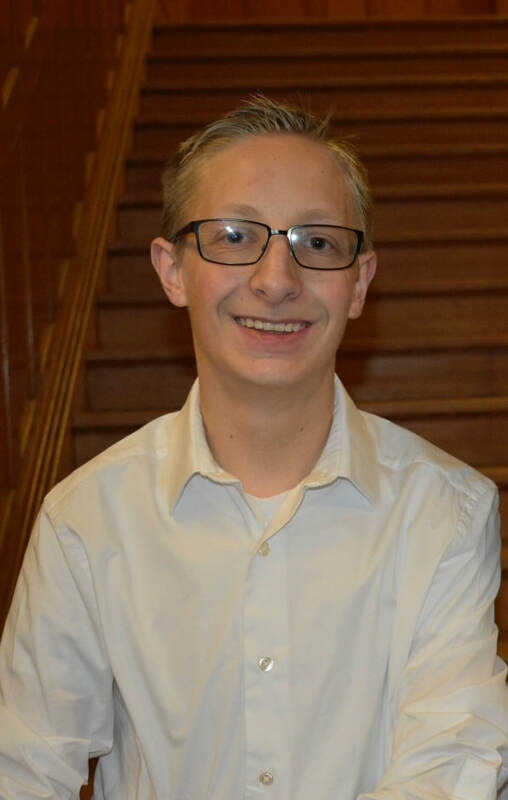 Raleigh also performs on tenor saxophone and has performed with the Pikes Peak Middle School Honor Jazz band for the past 2 years. Additionally, he performs with the Tri-Lakes Music Association. Among those who have influenced Raleigh are Thomas Chapman (beginning band), Michael Mozingo (middle school band), Jack Yonce, Genice and Rex Matzke, Claire Medlicott (piano), Roger Soren, Phil Olivas and Darren Kramer. Raleigh would like to thank all those who support him in his musical endeavors, particularly his mother and elementary music teacher, Cynthia; his father and soon-to-be high school music teacher, Butch; and especially his clarinet and saxophone playing twin sister, Ceci. Raleigh hopes to study music in college and become a professional musician and educator.